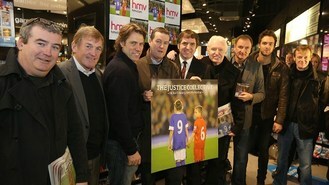 The version of the Hollies' hit He Ain't Heavy, He's My Brother by The Justice Collective was launched at Liverpool's HMV store by stars including football legend Kenny Dalglish and comedian John Bishop. The song was produced by Robbie Williams' long-time collaborator Guy Chambers with all the proceeds going to cover the legal costs of the families of the Liverpool supporters killed in the Hillsborough disaster in 1989. The song was inspired by the sight of two children who walked out to the track during a tribute to the dead at Liverpool's cross-city rivals Everton. Today Dalglish, Bishop and Liverpool Walton MP Steve Rotheram all called on the chancellor to waive the VAT on the single, something he has already done for the X Factor winner's single - the proceeds of which are also going to charity. John Bishop said he was hoping the VAT issue would get resolved, adding: "You can't realistically have one rule for one and not for another." Bishop said everyone involved was keeping their fingers crossed for a Christmas number one but downplayed his vocal contribution to the track. He said: "I was in the recording studio. There was me, Kenny, Alan Hansen, Heston Blumenthal, Steve Rotheram the MP, all singing. "And then we were followed in by Holly Johnson and Robbie Williams. I think we're on it somewhere but I think they probably thought, 'more Robbie than Bishop'. I'm more of a backing singer really, I'm more of a Ringo." A spokesman for bookmakers William Hill yesterday said the song was 1/7 to be Christmas number one with X Factor winner James Arthur 9/2 second favourite.